December 19th 2015: Amazon has revamped its Kindle range with a new budget Kindle and a shiny top-end model called the Kindle Voyage joining the old Kindle Paperwhite. 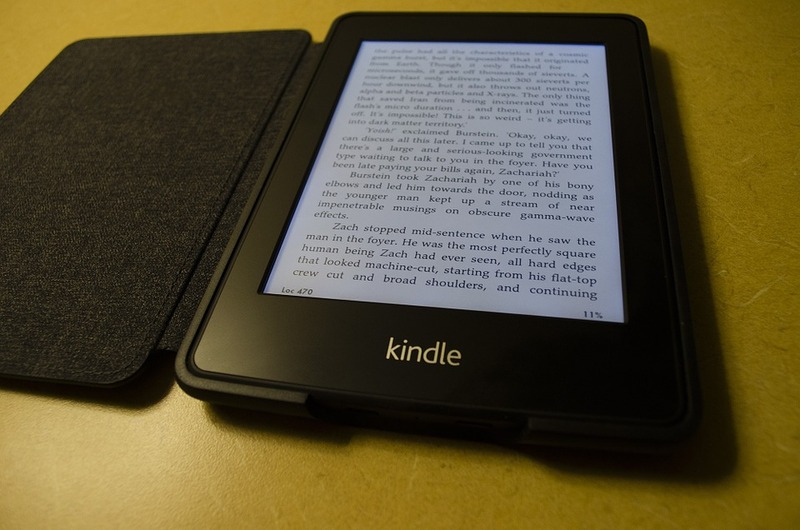 If you're thinking about upgrading or are tempted to buy a Kindle for the first time we compare the three models to explain what you get for your money. Of course all three eBook readers have access to the same Amazon store for books and unlike other eReaders they're not setup to buy books from elsewhere. Thankfully Amazon is still excellent both in terms of its range of titles and its competitive pricing. If you're an Amazon Prime member you can also access the Kindle Owners' Lending Library, which lets you borrow one book a month from a catalogue of 600,000 eBooks. Amazon has also launched Family Library, which lets you share your eBooks with your family. Essentially it lets you join two accounts together, so you can read each others books, plus you can add up to four childrens accounts to the pair of adults. You can now set up a Family Library via the Amazon website see About Family Library, so you can use teh service with the vast majority of Kindle devices and apps. The new Kindle's below have the software built in so you can set up a Family Library from the device. With that covered let's move on to the models in the current range. The budget Kindle costs £60 or £70 if you want it without lockscreen adverts (or as Amazon describes them 'special offers'). The standard Kindle gets a 6in touchscreen for the first time, as previous budget models relied on physical buttons to turn pages and a four-way control at the bottom to navigate menus and options. On the inside there's a faster 1GHz processor, although unless you have a very old Kindle model (three years or more) then it will be fast enough to handle the simple task of turning pages and browsing menus. Storage has been bumped from 2GB to 4GB but even 2GB is ample space to store thousands of books. Battery life will also be similar at around two weeks per charge if you read for an hour a day. If you last bought a Kindle three or more years ago and are tempted to upgrade then the new Kindle isn't worth the cash. The screen isn't much better than the older models and it doesn't feel as nicely made as them either. If you're looking for an upgrade, then look below. 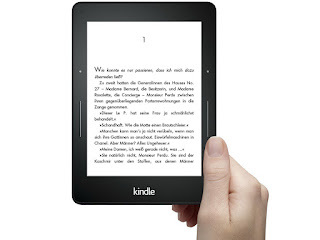 Amazon has just announced a new Kindle Paperwhite for 2015. The new model is essentially identical to the old one, with a backlit display for reading in any lighting conditions, but has a new, sharp display with 300 pixels per inch. This is the same display as that on the Kindle Voyage, below, which narrows the ground between the two models significantly. It's still available in Wi-Fi at £110 or £120 if you want it without lockscreen adverts, or with 3G (£170) so you can buy books anywhere in the world without needing to find a Wi-Fi network. It may not be the top model, with the Voyage below taking that spot, but this is the Kindle that most people should buy, with everything you need at a great price. Amazon's top-end eReader is the Kindle Voyage. The Wi-Fi only model costs £169 with the 3G version a whopping £229. So what do you get for the extra cash? As with the budget Kindle and Kindle Paperwhite the Voyage also has a 6in touchscreen display, but since the Paperwhite 2015 upgrade, its 300 pixels per inch is matched by the cheaper model. It is thinner and lighter than other Kindle models, but only just. You can turn pages by using the touchscreen or by squeezing the new 'PagePress' buttons on the side. It also has 4GB of storage and the similar battery life as the Kindle Paperwhite. Amazon claims the Paperwhite can last for eight weeks on a single charge based on half an hour of reading with wireless off and backlight set at 10. By comparison the Voyage apparently lasts up to six weeks under the same conditions. Our favourite feature is that the backlight finally has an ambient light sensor, so it adjusts automatically to the lighting conditions. We were amazed at how much difference this made, especially as we rarely bothered to tweak the Paperwhite's backlight manually except when reading in pitch black. If you read eBooks both at night and in the day, then the Voyage is a but there's really nothing wrong with the cheaper Paperwhite. The new budget Kindle is good value for people buying an e-reader for the first time but a pointless purchase for people considering upgrading from any old Kindle. The new Kindle Paperwhite 2015 is great value, has an excellent touchscreen with backlight and is the best upgrade option for people on old Kindle models. The Kindle Voyage is a refined version of the Paperwhite and now looks a little too expenisve given the slight differences. Other non-Kindle e-readers are available, most notably those from Kobo. The Kobo Glo (backlit touchscreen, £80) and Kobo Aura HD (high-resolution backlit touchscreen, £130) are both excellent e-readers. The Kobo Aura H2O (£140) has the added bonus of being waterproof, so you can drop it in the bath without destroying it. The latest model is the Kobo Glo HD which at £110 with a 300 pixel-per-inch display matches up directly to the new Paperwhite. For the full rundown of how Kobo differs from Kindle read our Kindle vs Kobo 2015 – eBook prices, eReaders and apps.